High cheekbones are a sign of beauty and youth. There are many factors attributed to the flattening or hollowing of the cheeks including genetic, congenital abnormalities, asymmetry, facial wasting from weight loss, aging or disease, trauma or surgical resection. Selecting the most appropriate implant or augmentation technique for each individual to achieve the desired cosmetic result, depends on careful analysis of your face. Both the facial soft tissues and bony skeleton deficit can be enhanced with implants in the correct areas. 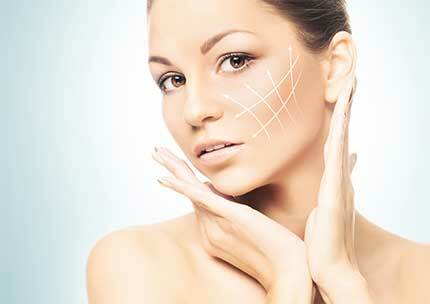 Malar implants augment the bony cheeks while submalar implants augment the hollows under the cheekbone. Many women and men are requesting cheek augmentation either as an isolate procedure or more commonly in combination with other facial rejuvenation procedures. Cheek implants can be performed in conjunction with facelift or neck lift correction of the jowls, mid face or sagging neck, with eyelid or blepharoplasty with lip augmentation or with skin resurfacing and wrinkle management. Cheek augmentation is a safe, effective procedure performed to restore balance, proportion and a younger appearance. As with all facial plastic and cosmetic surgery, a thorough medical assessment and realistic expectations are prerequisites. Your understanding of instructions and routines is essential to a successful final result. Cheek implants - are usually Silastic and vary in size and shape. The most appropriate implants will be selected for you. Fillers - these are injected either on top of the bone or into the soft tissues. The fillers can last for 9 to 12 months or more semi permanent fillers can last 1-3 years or longer. In most cases cheek augmentation is performed either under local anaesthetic with IV sedation at our Churchill Day Surgery or under general anaesthesia. An incision is made in the mouth under the upper lip. The facial soft tissues are then elevated, a pocket is made and the implants are inserted. Occasionally stitches are used to secure the implants externally, along with steri-strip, and these are removed after 7-10 days. The sutures inside the mouth are dissolvable. The surgery takes 1-1½ hours. You most avoid contact sport for 6 weeks after the procedure.